Read the blog about this recipe. 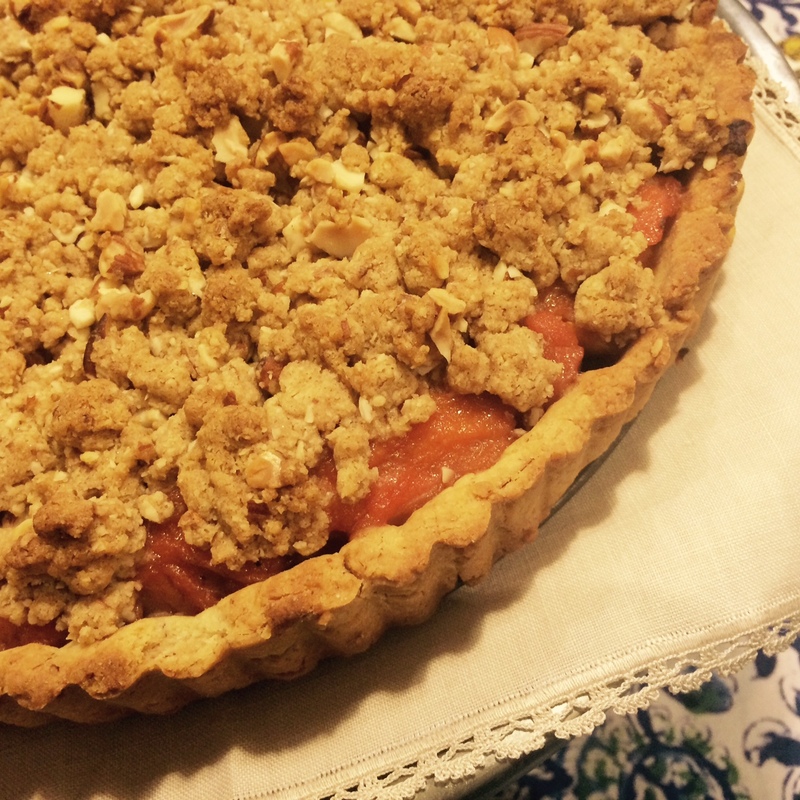 The quinces for this tart need to be poached first, and that takes some time (around 2 hours). Once poached, you can make the tart any time. Good handful of almonds, roughly chopped. Put the water, sugar and cinnamon stick in a saucepan and heat until the sugar has dissolved. Add the quince slices. Cover with a lid and simmer, stirring gently occasionally. Remove the cinnamon after 1 hour to prevent it discolouring the fruit. Meanwhile, cook the rhubarb in a little water in an uncovered pan. Stir to prevent catching and remove from heat once very soft. When the quinces are soft and have turned a rosy pink (about 2 hours), remove from the heat and strain (I keep the liquid and use it when making quince jelly). Add the cooked rhubarb to the quince. I make mine in the food processor, using the pulse function. If you prefer, you can mix this by hand. Combine the butter, sugar and egg. Next, add the flour and almond meal, a little at a time and alternating. Mix/pulse until just combined. Do not over-beat. Roll out and line a pie dish with the pastry. Blind bake at 180 for about 10 mins (take care not to burn the edges). Note: I started replacing some of the flour in my pastry with almond meal after making Manu Feildel‘s sweet shortcrust. His cooking really is to die for. Combine all the ingredients except the almonds in the food processor, mixing until everything is combined. Don’t over-mix – you want it to be crumbly. Mix through the almonds (you can do this earlier but if using a food processor take care, as you don’t want them to be chopped too fine). 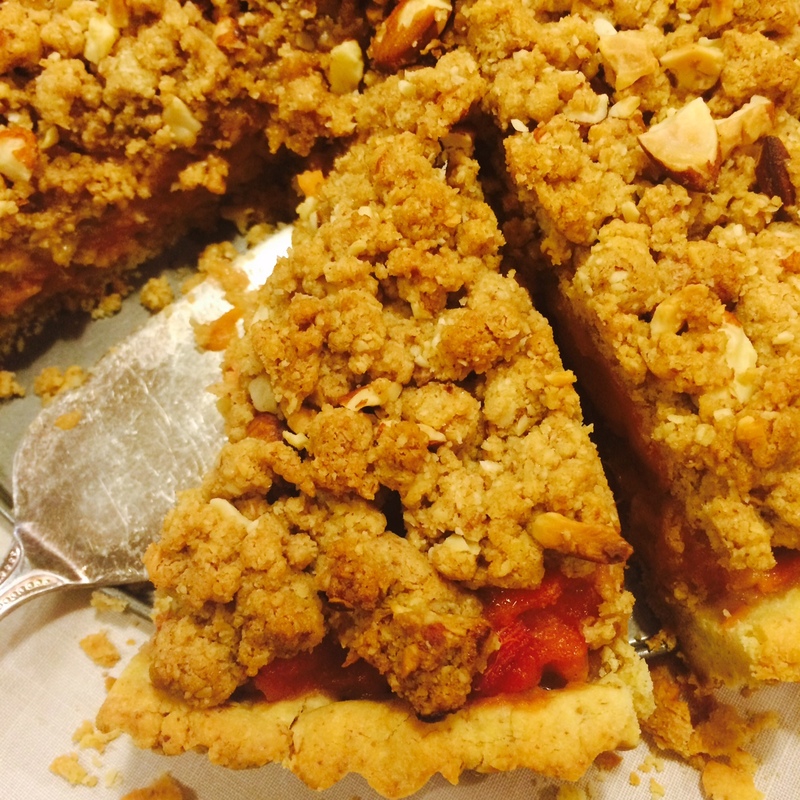 Fill the pie case with the fruit and top with the crumble. Bake for about 20 mins at 180, until golden and crunchy.